Linda Cunningham’s work is concerned with time, transience and contradictions. She gravitates to architectural and structural remnants of current and previously existing cultures, often posting the veracity of the photo-based transferred images against interpretive, fluid calligraphic drawing line and form. 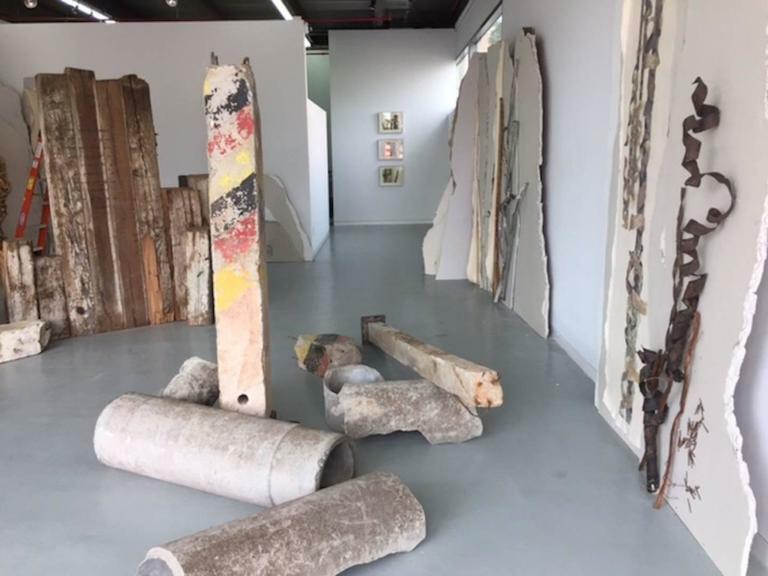 Discarded materials such as twisted steel beams & unraveling copper cable from the former German border juxtapose against poetry inscribed on antique wood doors epitomize the fleeting nature of power and control. Whose Land? Whose God? is a monumental installation which will open at ODETTA, Brooklyn, NY, July 7, 2017. “…and the walls came a tumbling down” refers to the Book of Joshua in the Tanakh or in Christian liturgy, the Biblical Old Testament, about Joshua and the battle of Jericho. Images from ten centuries of peaceful co-existence juxtaposed against the structures of collapsing barriers evoke hopeful possibilities in this era of devastating conflicts between the followers of Abrahamic religions." 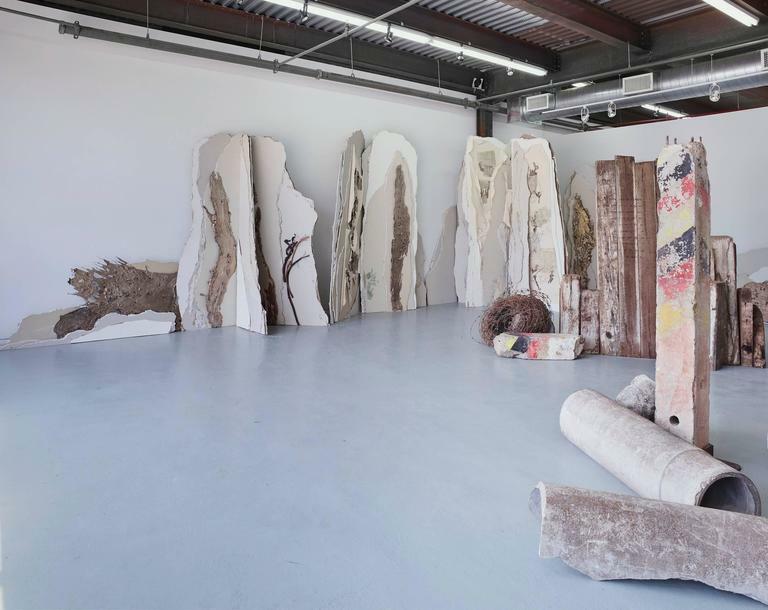 The tactile sensibility in Cunningham’s work comes from her interest in the qualities of materials, observed or found. 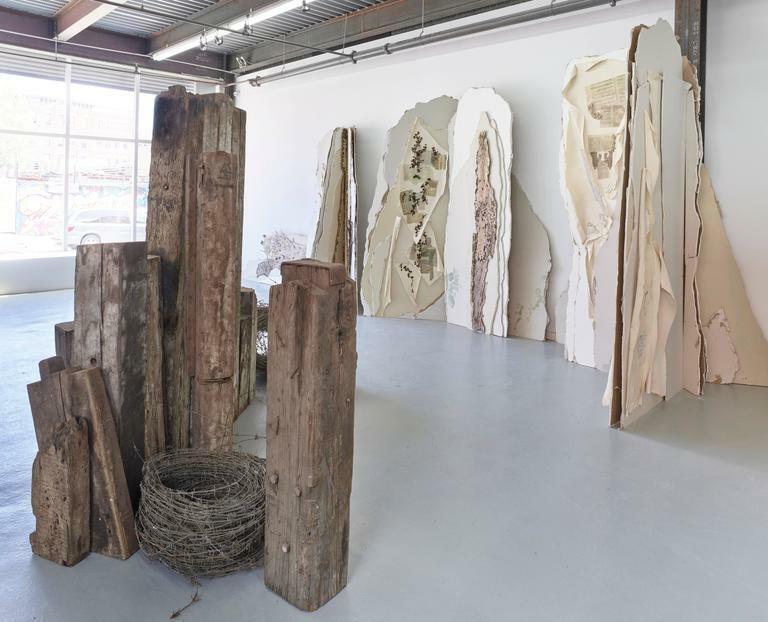 She transforms found materials, a kind of “Urban Mining,” yet preserves their cast-off qualities. Conceptually clear, she casts bronze pours from scrap military weapons. Some drywall “pages” of the book with seemingly abstract brown and rust colored photo-transfers on bifurcated sheets of canvas echo actual elements in the installation, unraveling underground copper cable that formerly operated the deadly machine guns and mercury lights guarding the former East German border. 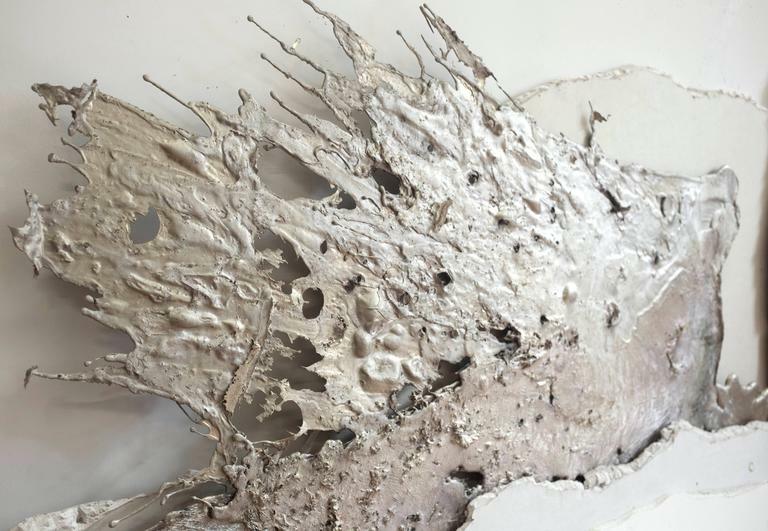 Canvases are also collaged with metaphoric rubble, acrylic, and pastel. The “old story” is collaged with golden bronze fragments on the book-like drywall wall structure In another area with photo-transferred images of ancient Arabic, Hebrew, Coptic and Greek texts.The historic texts from the years 2 to 11 are framed by dramatic golden, 6ft high textured bronze forms. 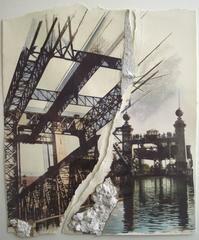 Linda Cunningham is a Bronx-based artist with a long New York and international exhibition career. ODETTA, in Brooklyn, featured her work in a Nov exhibit and in the Harlem FLUX art fairs, 2015 and 2016. Her 2013 installation in No Longer Empty’s “This Side of Paradise,”at the Andrew Freedman House was installed at the Bronx Museum, 2014 in an exhibition sponsored by the Bronx Arts Alliance. The Bronx Museum showed her sculptural installation ”Urban Regeneration” on its terrace, 2009/10. 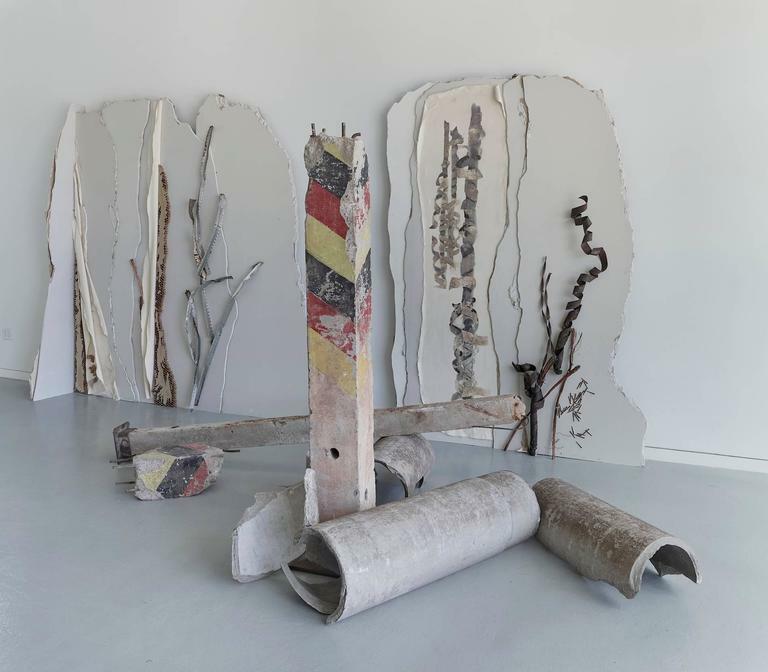 Exhibitions in Germany began with a Fulbright Senior Research Fellowship in Berlin and her monumental public sculptural installations & alternative memorials are permanently sited in Cologne, Kassel, Bad Hersfeld & Cornberg, Ger-many, Grounds for Sculpture, Hamilton, New Jersey and City of Sculpture, Hamilton, Ohio. Alternative memorials were sited at the CUNY Graduate Center across from Bryant Park, 1989-1995, in Tribeca and at UN Plaza, New York 1997-1998. Recent temporary public sculpture installations were at Westchester Sq., Bronx. NY, 2014 and Marcus Garvey Park, Harlem, New York City, 2016. This installation is site specific, and can be reconstructed to fit other specific dimensions. Individual parts of this sculpture can be sold separately. The concrete border posts and barbed wire are authentic remnants from the Berlin Wall.